The Hamilton LRT project is part of the Ontario government’s commitment to expanding transit in the Greater Toronto and Hamilton Area. This project presents a great opportunity for students to study the effects of the LRT on different aspects of the community. Questions surrounding projected traffic congestion, property values, anticipated employment growth, and improved environmental conditions due to decreased daily travel times and fuel consumption, can be explored. Students of the McMaster Transportation Engineering class created a traffic simulation of the current and projected conditions on a section of King Street near McMaster University. They used statistical models to project current traffic data into the future. 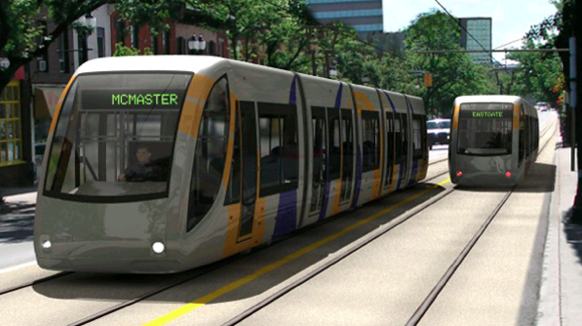 Students optimized LRT riders' travel times using a micro traffic simulation model. They consulted literature for additional traffic assignment modelling assumptions and reviewed literature discussing the economic and environmental impacts of the LRT project on Hamilton's community. Next students will generate suggestions to highlight the impacts of LRT and share their findings with community stakeholders.